The chair was original design in metal for outdoors major cafés in Lisbon and then to the rest of the country . Since then , the chair had it`s ups and downs due to the market openning, plastic furniture and other products . Althought the original model as a long time living amoung Portuguese people , the truth is, that for the Rest of the World this chair was unknow since 2013, the year that AROUNDtheTREE was born. The history of this chair is directly linked to his designer much more than a simple creation. Although people try to define some rules for good design at the outset, the reality is that it`s not always necessary or at least not used consciously in their creation. For years, many were the characters who tried to recreate a new chair based on the original model, but with no sucess. If Creating an object of worship is by itself a difficult journey in which most of the time it is not even the intention at the beginning, recreate, update and improve this same product is an even more risky and complex mission. At the end of the 80s, Alexandre Caldas was just a kid who had been introduced to a new world of furniture through the Factory that had originally produced the BICA chair in the 50`s. In 1992, at the age of 18, Alexandre Caldas became an integral part of the company witnessing the phenomenon of the renaissance of the metal chair by the hands of some more knowledgeable and clarified architects that knew the cultural legacy of this piece. During the next 10 years, the contact Alex had with this piece was massive, from production, marketing, sales to distribution. It was also during this period that he met a key figure in the transmission of the true story, Master Serafim. 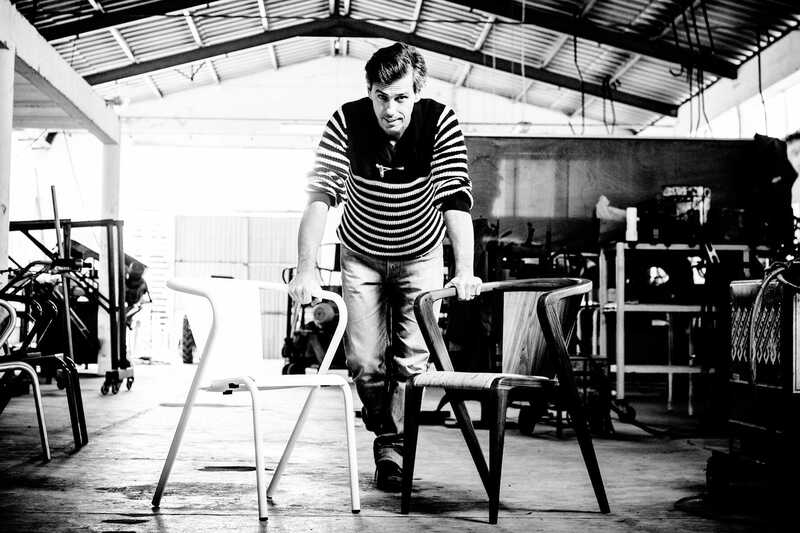 This master and craftsman, was the last bastion of the true story behind the BICA chair, because he was the right arm of the founder of that company, Gonçalo Rodrigues dos Santos. Inspired by this experience of life, by the stories of Mestre Serafim and especially by the lack of vision of the national entrepreneurs in not giving the true value to what had been bequeathed to them, embarks on a pacific but challenging crusade to homage 60 years of the history of the Design of this chair . However, without an academic background in design, Alexandre Caldas focuses on his ability to observe, in his critical power to find a way to tell this story. By the same time he and his wife Soraia Rangel was creating AROUNDtheTREE . During the process of creating a company of what would be a new national brand, another element responsible for creating the initial image of launch (Rogério Serrasqueiro) exerts a constructive criticism "pressure" on Alexander to give him something extraordinary that would help to launch the new Brand ... a hook as he called it. probably without realizing it, he had just thrown the spark that was missing for the creation of a World icon. The next day, the original Portuguese Roots Chair design was born again by an improbable designer ... the kid who at age 18 saw her reborn.